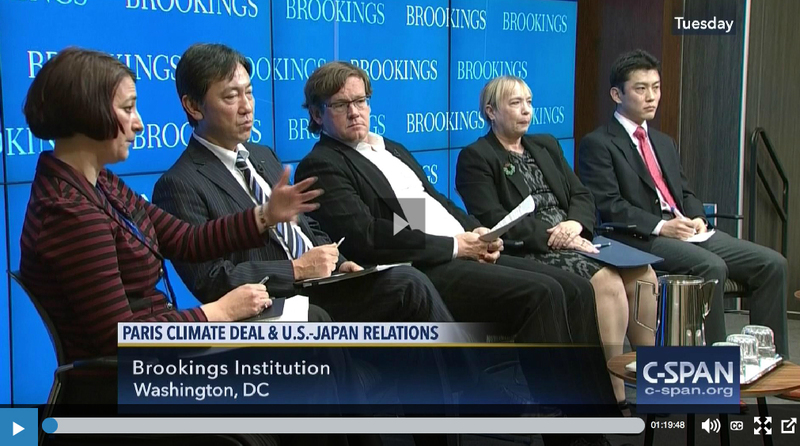 Sasakawa USA Fellow for Energy and Technology Phyllis Yoshida joined a panel of four other experts on December 20, 2016 at a Brookings Institution event discussing the Paris climate deal and U.S.-Japan relations. The panel of climate policy experts from the United States and Japan addressed critical issues for the future of the climate agenda and U.S.-Japan relations such as what the nature of the Paris commitments mean for the task of implementation, what kind of domestic transformation is required in each country, and how Japan and the United States can collaborate on innovation efforts to move away from carbon dependent-economies. Watch the full event, courtesy of C-SPAN, here.